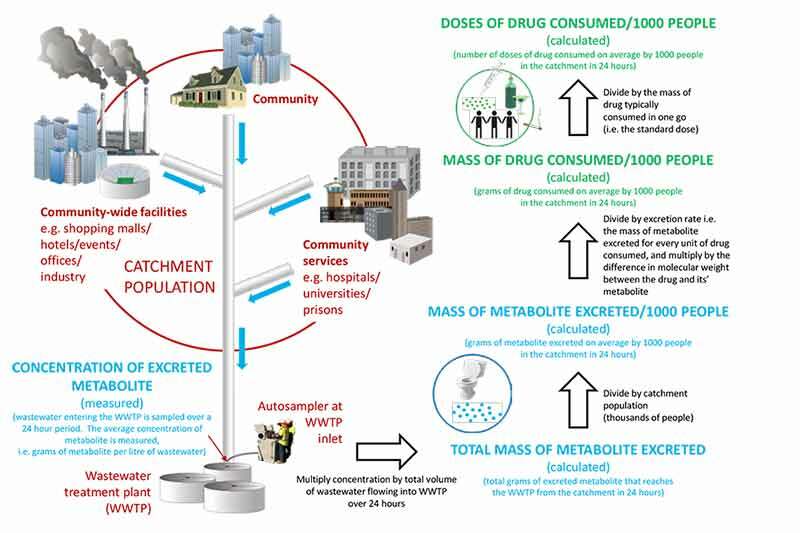 The Australian Criminal Intelligence Commission (ACIC) released the first National Wastewater Drug Monitoring Program Report (NWDMP report) yesterday. Sewer epidemiology or wastewater analysis has been applied previously as a tool to measure and interpret drug use (a 2015 study across 60 European cities and a 2014 study in Albany area in New York State). The National Ice Taskforce (NIT; Ice, also known as ‘crystal meth’, is a crystalline form of the drug methylamphetamine), formed in 2015, found that existing data from self-report user surveys, seizure and arrest data and medical statistics provide only a limited picture of drug consumption. The National Ice Action Strategy 2015 identified a need for governments to improve data and evidence to inform their responses,in order to ensure that any increase in effort and investment goes to areas of highest need. Hence, NIT recommended that a national wastewater capability be established to provide a more accurate and comprehensive understanding of drug use in Australia. Subequently, the Commonwealth Minister for Justice approved AU$3.6 million over three years from the Commonwealth Confiscated Assets Account for the ACIC to develop the NWDMP. The principle behind wastewater analysis is that any given compound that is consumed (swallowed, inhaled/smoked or injected) will subsequently be excreted either in its original form or a modified form, referred to as a metabolite, which will eventually arrive in the sewer systems. The amount of drug that was used over the collection period can be back-calculated from the amount of target compound in the wastewater stream at the treatment plant. The method is non-invasive and is done on a population-scale level, so individuals are not targeted and privacy is respected. The ACIC contracted the University of Queensland (UoQ) and through it the University of South Australia (UoSA) to deliver the capability on behalf of the ACIC and prepare the first NWDMP report. The universities entered into arrangements with the operators of a series of wastewater facilities across Australia to collect samples. This first report of a planned nine public reports to be released over three years, constitutes a baseline assessment of national drug consumption, providing data on usage patterns across states, territories and the nation, capital city and regional drug use, comparisons between some Australian locations and overseas countries, and where possible, comparisons with previous use in Australia. The data will guide government policy and measure of the effectiveness of supply and demand reduction initiatives in select locations around the country. Future reports are expected to build on the baseline assessment and contribute further data to track changes in usage patterns and to build a comprehensive and increasingly detailed picture of national drug consumption. The programme focuses on ice, and 12 other illicit and licit substances including cocaine, MDMA, tobacco and alcohol. It covers 51 sites in the capital city and regional areas across all states and territories, adding up to 14 million people, approximately 58% of the country’s population. The location of sites may change over the three years of the contract, depending on results during the first 12 months of the program. There will be two reviews, after 12 months and 24 months. The current report found that alcohol and tobacco were the highest consumed drugs consistently across all states and territories. It confirmed that ice is the most highly consumed illicit drug of those tested in all regions of Australia. Ice, consumption in Western Australia and South Australia was higher than the national average, in both the capital cities and regional areas. Cocaine use was the highest in New South Wales, in terms of doses consumed per day, followed by the Northern Territory. The report also suggests that significant volumes of prescription medications, fentanyl and oxycodone, are being diverted into the illicit market. There is high use of these medications in all jurisdictions, particularly in regional Queensland.